This year the fifth annual DigiCode Youth Programming Contest was hosted by the American University of Armenia. Over 300 participants from all the regions of Armenia and Javakhk had applied for participation. Fifty-five participants representing all the regions of Armenia reached the final. For the first time in the history of DigiCode the participants competed not only with apps written in Scratch and K-Turtle scripting languages, but also apps written in Python, a high-level scripting language. By the way, the Jury members showed great professional interest in the students of Armath engineering laboratories who had knowledge of scripting languages. It is noteworthy that unlike previous years, this year the participants came up with more optimal solutions. "Our goal is to educate a generation of creators instead of users, to provide opportunities to people, who due to their creativity dictate conditions. I played my first computer game in 1987-1989, the level of which was multiple times lower and in terms of quality inferior to those created by these children. Today our children create games of such a quality of which we, the teens of 90-ies could only dream. To build one's own future, one should not start to do something from age 18 and achieve results at the age of 25; one should start from age 12, achieve what one can achieve at the age of 16 instead of 25, and seek to have more achievements at the age of 25," said Ucom's Co-founder and Director General Hayk Yesayan. Karen Vardanyan, Executive Director at the Union of Advanced Technology Enterprises (UATE), the organizer of DigiCode, noted: "This year's works were more creative and fully reflected own ideas of their creators. Besides, it was very inspiring that in the final the students of our newly founded engineering laboratories didn't give in to experienced participants. Thanks to expansion of Armath engineering laboratories and growing interest in DigiCode, we intend to give regional format to this event, so that we can reveal all the hidden talents". The Jury members dedicated a whole day to get familiarized with the works and apps of Armath students. Among Jury members there were Satenik Mnatsakanyan (Leviathan), Natalya Turovtseva (Ucom), Artur Khalatyan (AUA), Arman Poghosyan (Instigate), Arman Atoyan (Arloopa), Vahe Torozyan (Mindup Games), Tigran Minasyan (Noor Games), Hrach Khachatryan (Simotech) and Gor Vardanyan (FimeTech). In age groups under 13 and over 13, the winners of "Best Game" award were Christian Aleksanyan, a student of Armath laboratory operating in Artsakh IT Center, for his "Armenian Soldier" game, and the students of Sevan High School Arayik Gabrielyan and Shahen Hakobyan for their co-authored "Unknown Soldier" game. 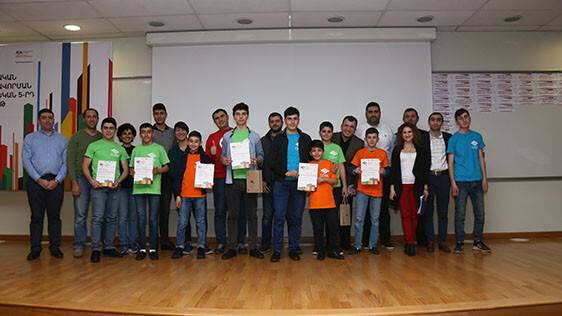 The winner of "Best Algorithmic Solution" award was Edgar Harutyunyan, a student of Masis Basic School N 1, for his "3D Parallelepiped Rotation" app. The winners of "Best Interactive Animation" award in age groups under 13 and over 13 were a student of Gandzak school N 1 Torgom Misakyan for his "Arduino Laboratory" app and a student of Vanadzor Basic School N 19 Aram Khachatryan for his "Amusing Physics" app. The winner of "Best Drawing and Design" award was Tigran Khachatryan, a student of Vardenis Basic School N 2, for his "Owl" game. 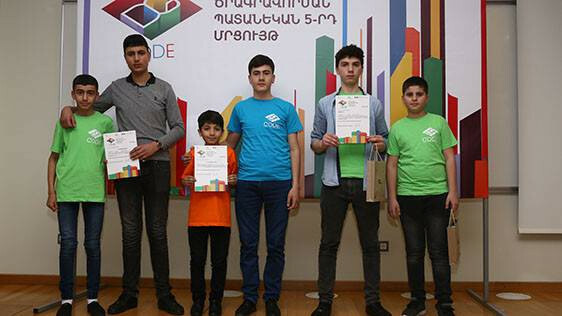 Sahak Sahakyan, a student of Armath laboratory operating in Gyumri Family Center, was the winner of "Gadget Integration" award for his "Sahak's Bot" app written in Pyhton scripting language. The second and third places in the same nomination category were taken by a student of Talin High School Roman Mkhitaryan for his "CarinSpider" app and an Armath student Grigor Maghzanyan from "Yerevan, My Love" center for his "RFID Camera Security" app. The winners received monetary award from Ucom. Particularly encouraging the school-age students of Armath laboratories, who have knowledge of Python scripting language, Ucom awarded tablets to the best three nominees in that nomination category. The American University of Armenia gave monetary award to the group leaders of winning participants. DigiCode helps to reveal talented schoolchildren studying engineering throughout the territory of Armenia and encourage them to become from game consumers to game makers. DigiCode has been held by the UATE since 2015. 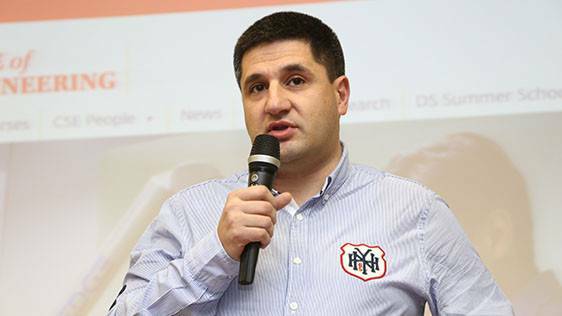 Ucom is the general sponsor of DigiCode, and the American University of Armenia is the c-organizer of the event.